Find, Mix and Watch. That is the slogan of YouTube's newest addition YouTube Disco. The new feature is basically a music exploration service. It begins by entering an artist, band or song using the search form on the start page. YouTube will then crawl its vast database and display a results page that consists of a music playlist of songs by that artist, related artists, artist information (if available) as well as two additional playlists. The first playlist mixes the original artist with related artists while the second displays only related artists and their songs. This makes the second option work similarly to Pandora Radio. Songs from all playlists can be mixed together and viewed on the same page. YouTube Disco can obviously be used to play only songs from one artist, or songs from that artist and related artists. The latter seems to be the main use of the service as the other option is also possible directly on YouTube. The music videos that are selected in the playlists are not necessarily high quality videos as they can also contain live or fan made videos. Update: YouTube Disco is still available on the video portal, but not linked from the main page. The main site links to popular artists that you can click on, and offers a search form to find specific artists or songs. Depending on where you are connecting to YouTube from, you may not be able to access all of the videos suggested to you. You can also play the top 100 list right away with a click on the top 100 link. Update July 2016: YouTube Disco is no longer available. We have removed the link as a consequence. The new main location for all things music is the music category on YouTube. It features trending and popular videos, playlists, and channels for you to check out. Other than that, you may only use the search to find videos featuring a band or artist that you are interested in. The suggestions displayed on the left of a video may help you as well. 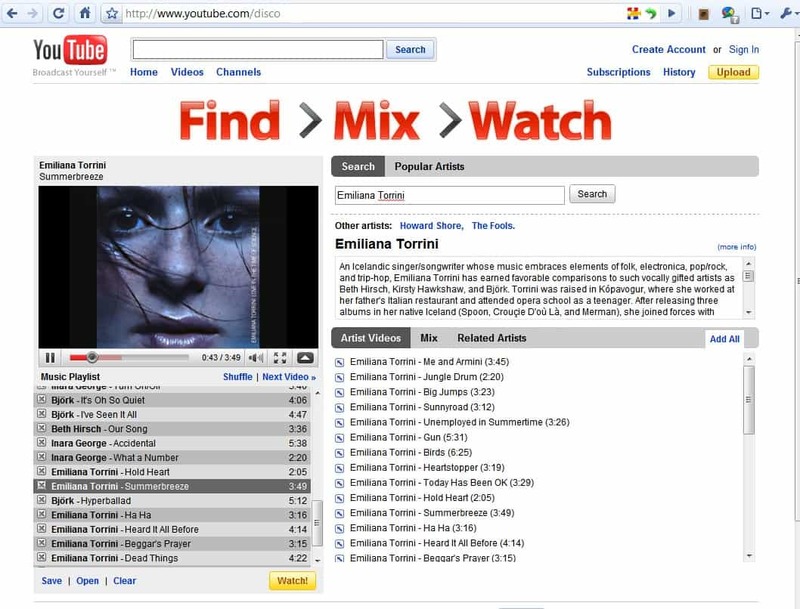 YouTube Disco was a music discovery service by Google that allowed you to find songs by the same artist, or songs by similar artists on YouTube.